Your physical therapist will perform a clinical evaluation to determine both the source and the cause of your symptoms. 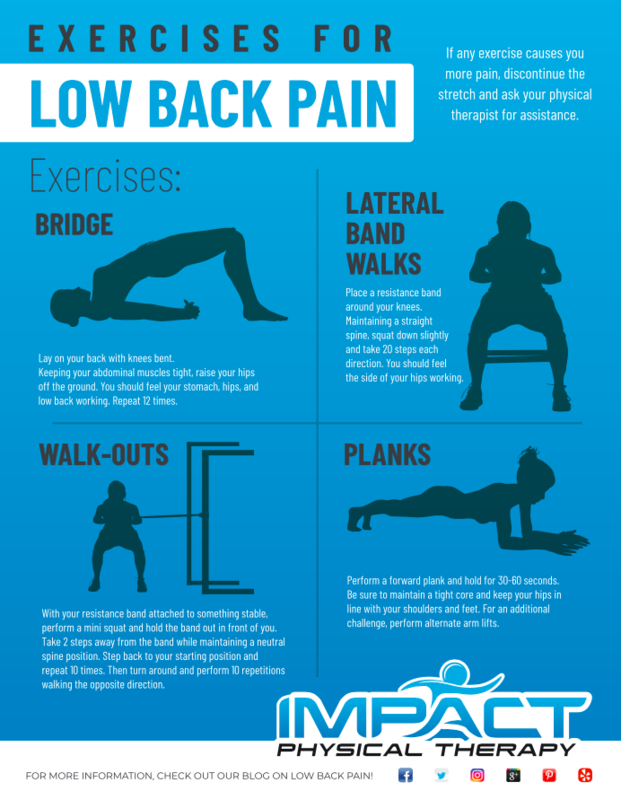 Below is a list of exercises that might assist you in relieving your low back pain while you await your appointment. If any exercise causes you more pain, discontinue the exercise and ask your physical therapist for assistance. Lay on your back with knees bent. Keeping your abdominal muscles tight, raise your hips off the ground. You should feel your stomach, hips, and low back working. Repeat 12 times. Place a resistance band around your knees. Maintaining a straight spine, squat down slightly and take 20 steps each direction. You should feel the side of your hips working. Perform a forward plank and hold for 30-60 seconds. Be sure to maintain a tight core and keep your hips in line with your shoulders and feet. For an additional challenge, perform alternate arm lifts. With your resistance band attached to something stable, perform a mini squat and hold the band out in front of you. Take 2 steps away from the band while maintaining a neutral spine position. Step back to your starting position and repeat 10 times. Then turn around and perform 10 repetitions walking the opposite direction. We know it helps for many people to have a visual so here is a video displaying some effective exercises to help with low back pain. By incorporating these 4 key strengthening exercises into your daily regimen, you will start to develop the muscles that have been causing you pain. 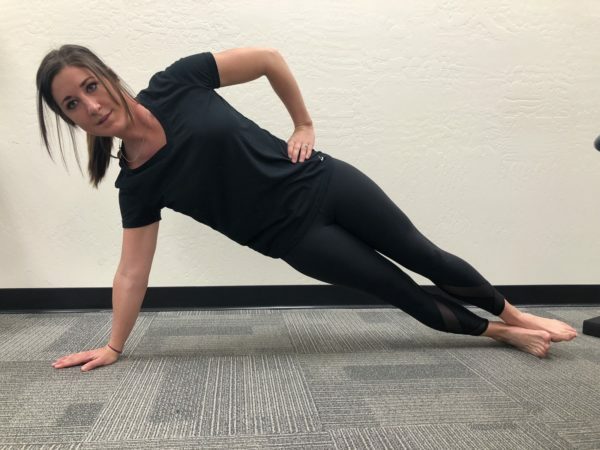 Also, here are additional stretches for low back pain that are effective in loosening you up for your exercises and some surprising contributions to low back pain you might not have thought about before. Be sure to reach out to our team here at Impact Physical Therapy and schedule your free consultation today!